Ding Junhui has completed a thrilling 13-10 defeat of Ronnie O’Sullivan to clinch his place in the last four of the Betfred World Championship. The win for China’s top player ensures him a third Crucible semi-final and sets up a repeat of last year’s final, where he lost out 18-14 to Mark Selby. Ding’s previous meetings with the five-time World Champion O’Sullivan saw him trail 10-2 in terms of head to head record. However, on this occasion the 30-year-old’s third win over the Rocket was sealed in a poised and confident manner. Ding looked at ease, making 13 breaks over 50. O’Sullivan’s bid to win a sixth world title and draw level Ray Reardon and Steve Davis will have to wait for another year. However, despite not lifting the sport’s biggest crown, he can reflect on a season where he made history by clinching a record seventh Masters title in January. A blistering session yesterday evening from Ding put him in poll position to book a semi-final berth this afternoon. He held four frame cushion with the score at 10-6 when they got underway today. O’Sullivan immediately applied the pressure by taking the first frame of the session. The Rocket then cranked up the heat further with a break of 97 to move within two at 10-8. 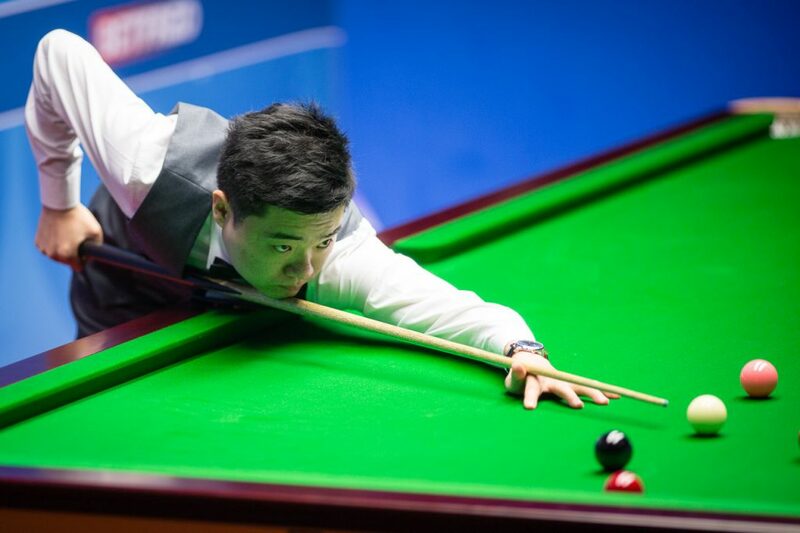 However, 12-time ranking winner Ding showed no signs of nerves as he responded to O’Sullivan’s charge with a contribution of 69 to claim the 19th frame. There was then an extraordinary piece of break building craft from O’Sullivan. He compiled a quick fire run which fell one point short of the maximum break. After potting 12 reds with blacks, he fell out of position and was forced to take the pink, eventually clearing up with the third 146 break in Crucible history. That took the scores to 11-9 at the interval, but when they returned Ding regained control of the match with a tremendous contribution of 87. He then looked set to clear up and secure the win. However, after stringing together 63 points, his attempt to go into the pack left only a tricky ball tight to the cushion to go at. Ding missed and O’Sullivan held his nerve to clear with a break of 73 to extend the match. It could have been a hammer blow for the world number four. However, he immediately regained his composure and produced a break of 117 to reach the last four with a 13-10 victory. 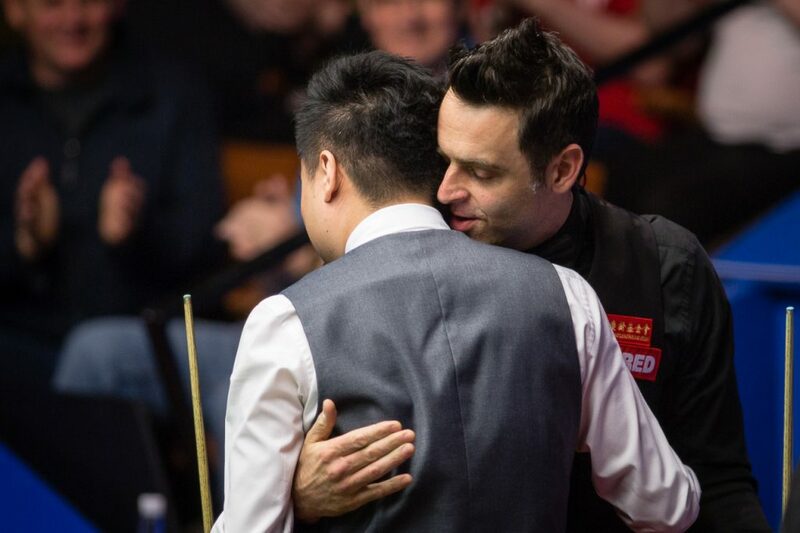 The pair embraced in an emotional moment after Ding deposited the final ball. Ding remarked: “I played great. I kept my form from the first frame to the last frame and all match I tried put Ronnie under pressure. I don’t know if he felt it, but I tried to do it. I don’t have a good record against Ronnie. Every time I had chances I used to think too much about it, but this time it was quite easy. “I didn’t know that the score was enough until people were clapping and I realised it was over. It was feeling good to play well every frame. Ronnie just said I look a different player, I’m looking stronger and he knows what happened. Every time I play him I’m really thankful to him, he is a top man and to be like him, you have to work hard. “I’m proud to have support from Ronnie, my family, the people of Sheffield and China. I just try to do the best I can and this is my dream from when I was a child. Every year I am here and try to win titles, from last year I came through the qualifying to try and win the title, and this year I have more confidence. 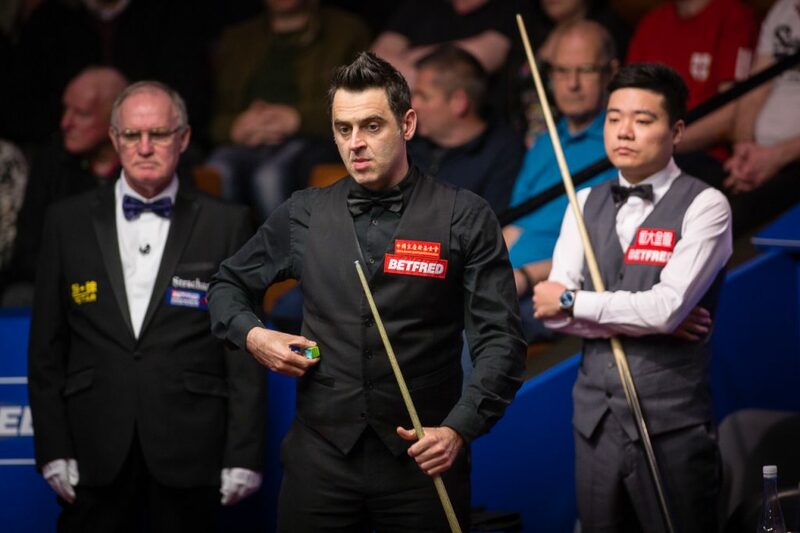 O’Sullivan remained upbeat after the loss and emphasised his love for the sport, as well as paying tribute to Ding. O’Sullivan said: “As I was coming off it felt really emotional. I’m quite an emotional person anyway. It was nice, he’s and special lad and a beautiful guy. I know his family really well, so I know he comes from a good stock, he hasn’t got a bad bone in his body. He wants to win this title so bad. Ten years on from our match at the Masters where he was in tears, he’s hugging me and beating me. Last time it was me beating and hugging him. It’s a decade on and he’s in a great place, I wish him all the best. Barry Hawkins holds a 9-7 advantage over Stephen Maguire going into their concluding session. The Hawk is looking to reach his fourth semi-final in five years and the pair will play to a finish this evening.